Hello, everyone! 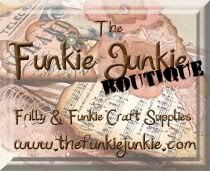 Julia here to welcome you to A Vintage Journey's Destination Inspiration for October. Today we have arrived at Terminal #4! 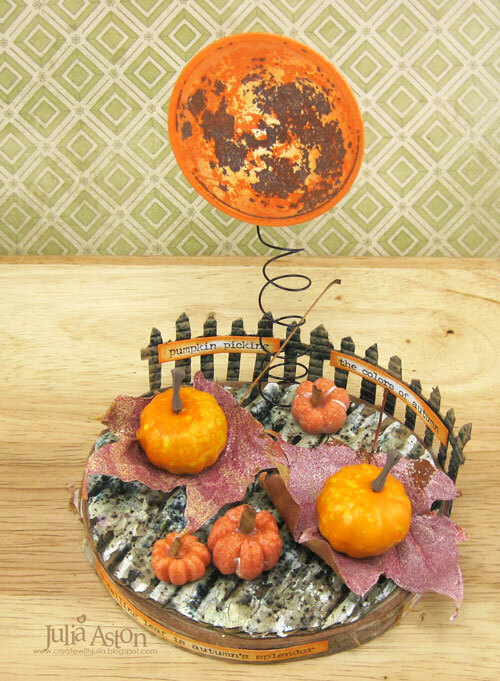 With the supplies in my travel bag, I created a fall pumpkin patch decoration with a harvest moon overhead! Here are a few photos of how I created this. 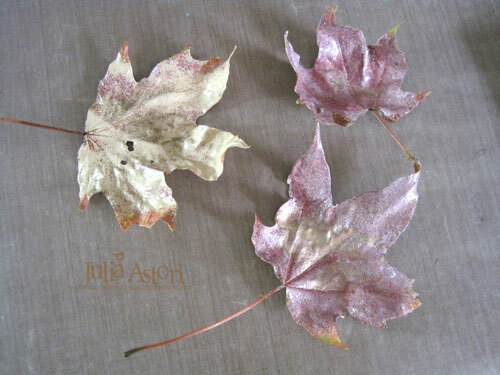 I took some real fall leaves that I picked up on a walk recently, they were lovely fall colors or orange, red and yellow but I knew they wouldn't last so I pressed Versamark ink onto them and embossed them with a mixture of tan, cranberry and brown embossing powders to hopefully preserve them. For my base, I took a thin slice of an aspen branch that Kent had cut for me some time ago, and cut a piece of corrugated cardboard to fit over the top. I ripped off most of the top to expose the corrugation. I covered the cardboard with Finnabair White Crackle Texture Paste and let it dry overnight. 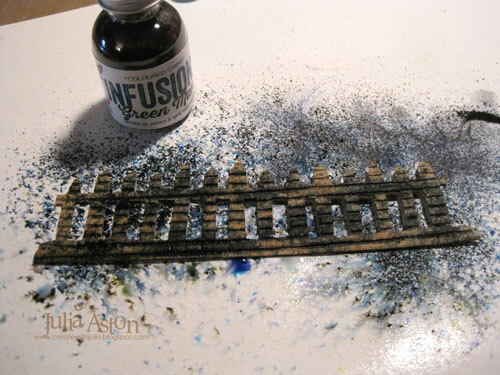 Then I sprinkled Infusions Sleight Blue and Green Man from PaperArtsy over the crackle and spritzed with water to activate the colors. There was still a lot of white showing, so I rubbed some Forest Moss Distress Ink on my craft mat, spritzed with water, and painted the color over the base. I wasn't exactly sure what I was trying to make it look like - but felt at this point it rather looked like tilled soil in the pumpkin patch so I was happy with it! 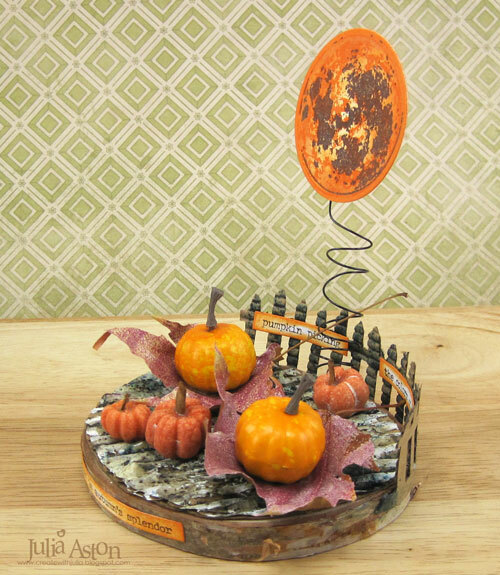 I recently purchased this lovely To the Moon stamp set from Altenew and knew it would be perfect to use to create my big harvest moon over the pumpkin patch. 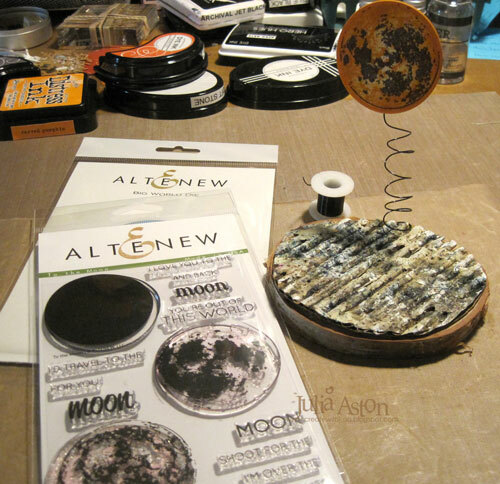 I die cut the circle twice and stamped both pieces with the 3 layers for the moon. I used Soft Stone for the base color, Orange Zest for the first crater stamp and Smokey Shadow for the 3rd layer. Then I sponged the edges with Distress Carved Pumpkin to really make it a bright fall moon. I curled a wire over a pen and attached one end between the tree base and the corrugated piece and the other end between the two pieces of the moon and it stood up brilliantly - just as I hoped it would! 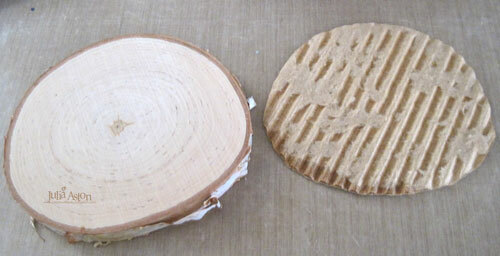 To add another die cut to my project - I cut a fence out of corrugated cardboard using Tim's On The Fence die. I colored the fence with Infusions Green Man and spritzed with water. I adhered the fence around the back edge of the base, adding some Idea-ology Small Talk/Occasions stickers to the fence and around the front of the base that I sponged with Distress Carved Pumpkin Ink. 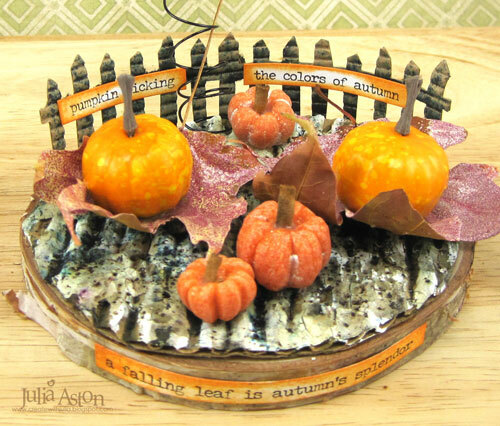 I adhered my leaves to the base along with Idea-ology Pumpkin Pieces and Mini Pumpkins. I added little pieces of cinnamon sticks as stems for the Mini Pumpkins. 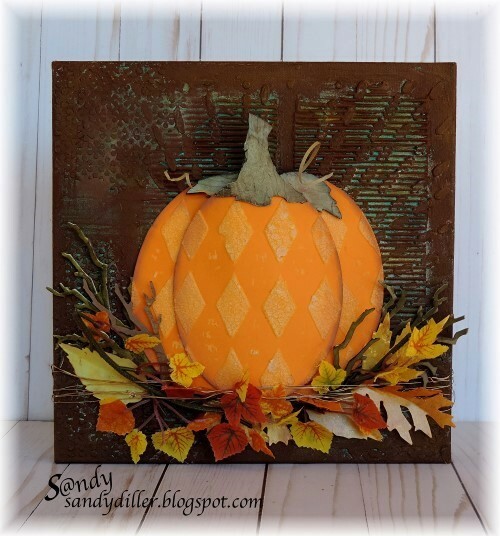 I just love this little pumpkin patch - no matter what angle I look at it from! 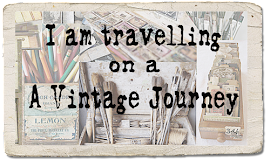 I hope you have enjoyed your stop at Terminal #4 and that you will join in Jennie's wonderful A Vintage Journey challenge this month - Crazy for Autumn Colour which you can find HERE. 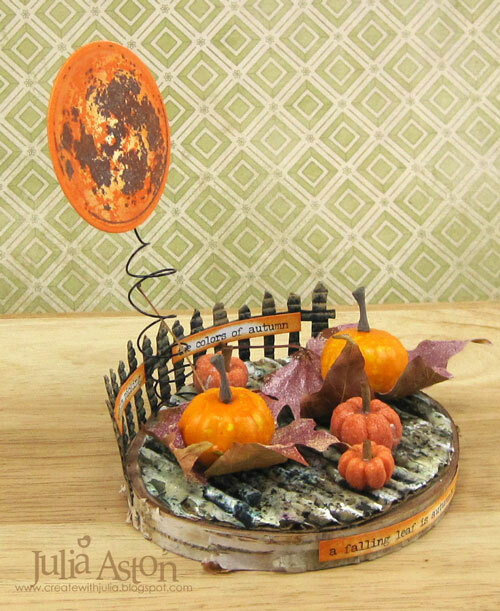 Oh Julia I absolutely adore your little pumpkin patch, - such a clever way to use this month's ingredients!! The way you did the big harvest moon is genius, and I have to say I just love that stamp set, it is just perfect for this project and you used it brillinatly! A fabulous final project for this month!! A great way to finish the month with it's rich autumn colors. This is fab Julia. I especially love the color orange so this is perfect. 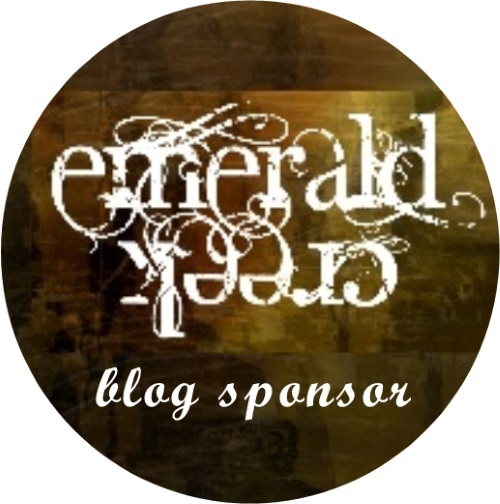 Thanks for sharing your process with us. 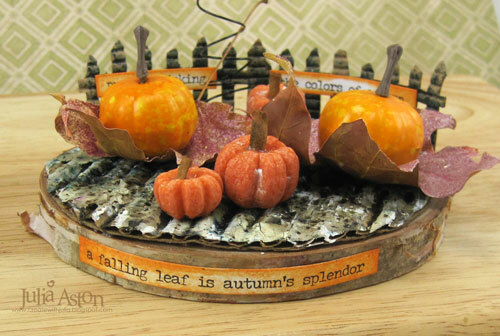 Beautiful Autumn home decor project, Julia! 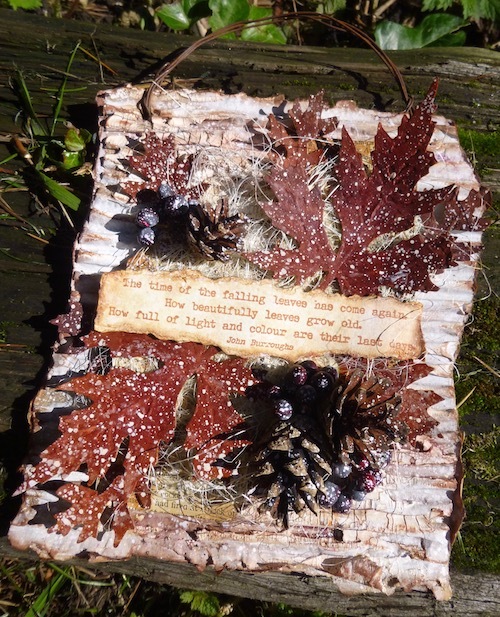 I love all your natural elements you've incorporated, and those leaves look fabulous in the embossing powder. Very clever technique! 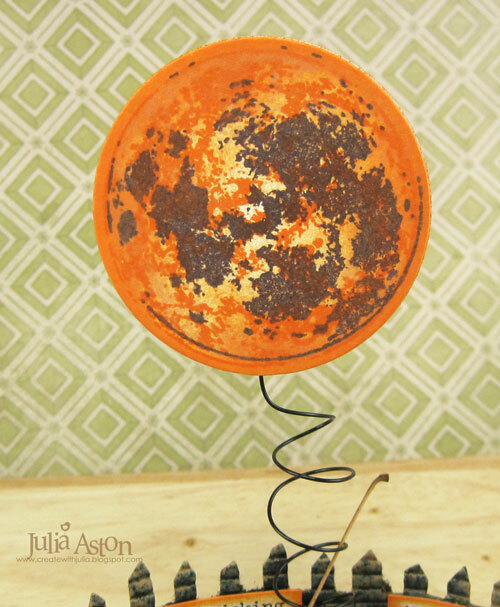 The Harvest Moon is gorgeous shining down on your pumpkin patch! Thank you for your inspiring step by step! Hugs! Absolutely brilliant, Julia - your pumpkin patch is a complete delight. (I can't help but think of Linus awaiting the arrival of the Great Pumpkin in Peanuts!) . Brilliantly designed, beautifully executed, full of gorgeous details - what a triumphant finale to this month's Destination Inspiration posts. 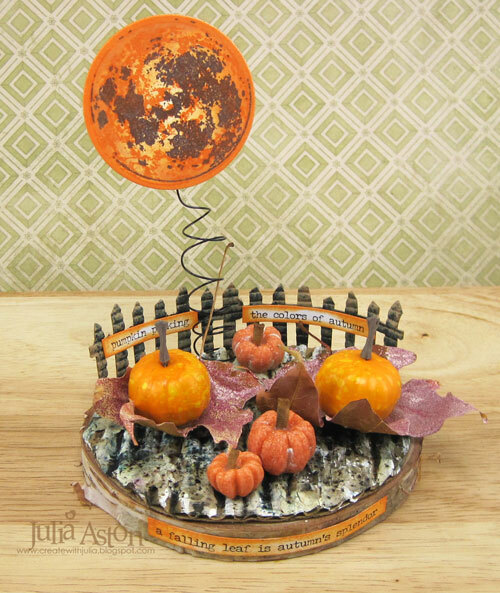 oh Julia what a fantastic idea to create your own little pumpkin patch and harvest moon! . It really is a fabulous piece of creativity and such a great way to use the contents of the travel bag . An ideal make for this time of year .